VirtualBox is a good operating system-level virtualization platform alternative when compared to other more popular utilities such as VMware, because it is free & open-source. However, the by-default hardware integration between the host & the guest operating system, is not as tight as it is under VMware, at least in my experience. For instance, if you were to run a GNU/Linux distribution such as CentOS, under Windows 8.1 (the host), then you might immediately notice that the mouse pointer movements are not quite responsive or sensitive, or that the screen resolution cannot be set to its maximum etc, compared to the host operating system. But all these (& a couple more) drawbacks can be fixed by installing an additional VirtualBox software pack called the ‘Guest Additions’. Once installed, it enables tighter hardware integration between the host & the guest OS, after which, you would not actually be able to tell that you are logged into a virtual machine at all. 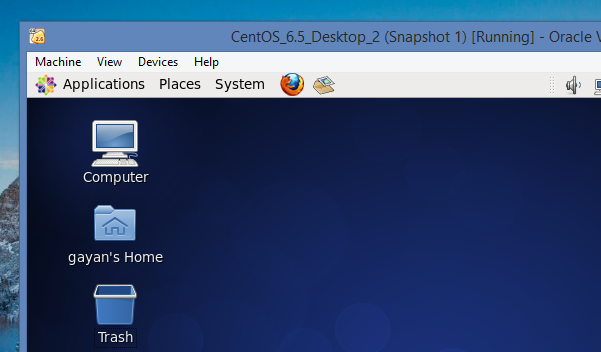 Step 1: First run your CentOS 6.5 virtual machine. 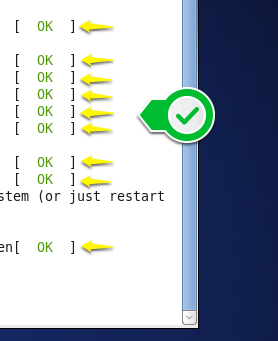 Then open a terminal window and enter the below command to become the root. When asked, enter the root’s password. Step 2: Now enter the below command. This will give you an output containing the currently active Kernel’s version. Use your mouse to copy it (or you can type it in if you like). Step 3: Now enter the below command and append the above copied Kernel version after the ‘-‘ sign, don’t leave any spaces in between. Step 4: It might take a couple of minutes to install, depending on the speed of your internet connection. Once it finishes, we have to install another package called ‘gcc’ (GNU’s C++ compiler). Use the below command for that. Now we are done installing the prerequisites and can move on with the ‘guest additions’ installation. 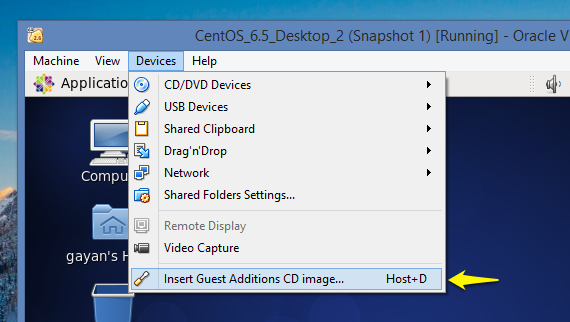 Step 5: This time, click on the VirtualBox menu of the VM, and go to: ‘Devices’ --> ‘Insert Guest Additions CD image…’, as shown below. The installation might take a minute or two… so be patient. If everything goes accordingly, you should get an output similar to the below one. If there are no ‘Failed’ messages, you are good to go. Once everything finishes, it will ask you to type the ‘Enter’ key. After that, for the changes to take affect, please reboot the computer. From next time on, you should notice the mouse pointer movements are extremely precise & that you can actually run the virtual machine in fullscreen (or resize it freely) using the maximum native resolution of your display screen. As briefly mentioned in the beginning, it improves few other deep hardware integration also, but those two are the easily noticeable ones. That’s it, good luck (if the ISO gets mounted every time you log into the CentOS virtual machine, then right click on its icon on the desktop and choose ‘Eject’). How about for centos 6/7 server with no GUI. text based only CLI?? Sorry about the late response 🙂 . You can install the ‘Guest Additions’ on the Basic Server Edition (without the GUI) by first inserting the ‘Guest Additions…’ as mentioned in the article. After that install the ‘kernel-dev’ and the ‘gcc’ packages also. Just follow the on-screen details to set things up. That should do it! (again, sorry about the late response). 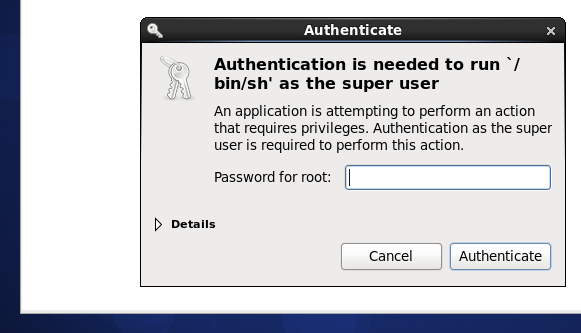 I have followed your instructions, which worked great for a CentOS 6.6 guest on a Windows 7 SP1 host. As soon as the Guest Additions compiled and installed in the VM, they immediately worked! However, I shut down and then rebooted the VM and the Guest Additions are not working; that is, my cursor becomes captured by the VM and I have to press the right Ctrl key to make the VM release my mouse cursor. When the VM booted, two message windows popped up saying, “VBoxClient: The VirtualBox service is not running! Exiting.". One disappeared immediately and the other disappeared after a few seconds. I checked the Service Configuration and it indicates all three Vbox services are running; vboxadd, vboxadd-service, and vboxadd-x11. Any ideas on how to get the Guest Additions working without re-installing them on every boot up of the VM? I’m not exactly sure what the issue is. Have you tried reading the log file ? (select the Guest OS and right click and select ‘Show log…’). Gary, you have to install all updates for you Centos before you install vBoxAdditions. Perfect instructions!!! I am working in full screen with a normal mouse! thanks. You’re welcome Bruce 🙂 . Bidirectional clipboard and shared folders also work well. The only thing that does not work is USB-integration, but that’s an old issue. You’re welcome George 🙂 . installing Guest Additions on RHL 7.2 on Windows 10 host, btw. 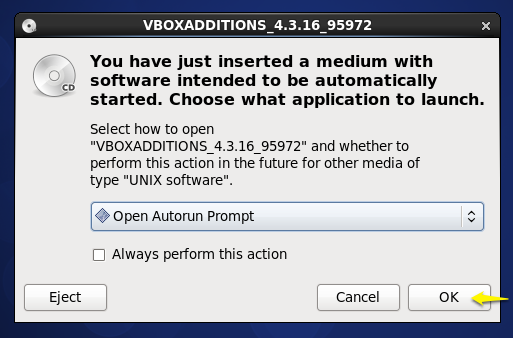 Go to your version (as of today, 5.1.8 is the latest non-Beta), then look for “VBoxGuestAdditions 5.1.8.iso” and download it to your PC. Now I have full resolution dual monitors in the VM! You need to have the VERY LATEST updates, of CentOS and VirtualBox and GuestAdditions. I think what was causing heartburn before was trying to get CentOS 7 with an older version of VirtualBox and GuestAdditions. Once everything was updated to the latest, it just all snapped into place. Thanks again for these valuable instructions!